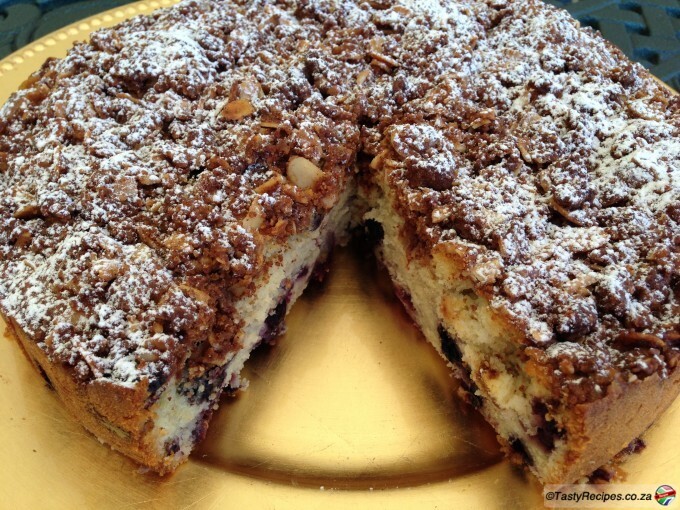 A simply delicious moist coffee cake studded with blueberries and topped with a crunchy almond streusel. Grease and flour a 10 inch springform pan. Sift together the flour, baking powder and salt. Keep it aside. In a large bowl, cream together the butter and sugar until it is light and fluffy. Fold in the flour mixture alternately with the milk. Mix it until it is fully incorporated. In a small bowl, combine brown sugar, flour,cinnamon and chopped almonds.